Religion. Power. Politics. Ideas and institutions that have been laden with a baggage of meanings picked up through the course of history - and which, unfairly or not, are often defined by these historic and social contexts. In this thought-provoking book, Ivan Strenski unpacks the central concepts and influences of religion, politics and power, and provides a new theoretical framework to think about what they mean in today's society. In addition to offering radical critiques of the religious and political perspectives of thinkers such as Talal Asad and Michel Foucault, Strenski moves beyond the theory in applying his intellectual framework to a variety of real-world issues, including insights into suicide bombers in the Middle East.Erudite and engaging, When God Plays Politics provides a timely and highly original contribution to our understanding of these concepts. It tries to dislodge readers from conventional thinking about politics and religion, and in doing so, helps make sense of the complexities of our twenty-first century world. 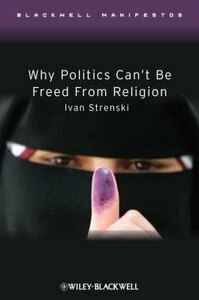 About "Why Politics Can't Be Freed From Religion"
Ivan Strenski is Holstein Family and Community Distinguished Professor of Religious Studies at the University of California, Riverside. He is the author of numerous books, including: #60;i#62;Contesting Sacrifice: Religion, Nationalism and Social Thought#60;/i#62; (2002); #60;i#62;Theology and the First Theory of Sacrifice#60;/i#62; (2003); #60;i#62;The New Durkheim: Essays on Philosophy, Religious Identity and the Politics of Knowledge#60;/i#62; (2006); #60;i#62;Thinking About Religion: An Historical Introduction to Theories of Religion#60;/i#62;; and #60;i#62;Thinking About Religion: A Reader#60;/i#62; (both Wiley-Blackwell, 2006).